The Giant Termite Mound is the smallest and least varied of the minor dungeon encounter tables because it's... well, full of giant termites. I've nearly finished the table for the Labrynthyne, and I assure you, that one is full of really weird crap. accompanied by an extra-large retinue of workers. 2. 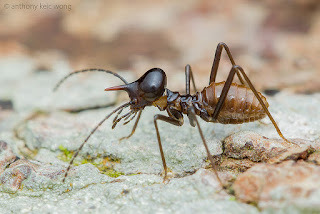 Giant Parasitic Wasp – deadly enemy of the giant termites and their nymphs. 3. Cordyceps Infected (1d4) hosts to a mind-altering fungus, 20% of bites force saves against infection. 4. 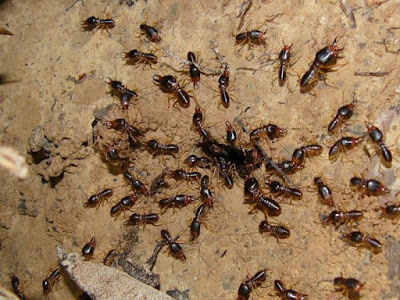 Termite Nymphs – inoffensive smaller and softer versions of workers, can be coaxed into producing a strong natural glue, adult workers are encountered in a few rounds 50% of the time. 5. Worker Termites – standard pale-bodied giant worker insects with strong chewing jaws. 6. Huge Centipede – massive venomous crawler, hungry for termite larvae and other soft-bodied creatures. 1. Sinkhole – 50% collapse on themselves, 50% empty into a lower area. 2. Sentry Mold – causing this pale blue-green mold to discharge its spores will attract worker and/or soldier termites. 3. Drummer – relative of the ubiquitous shrieker fungus, this species creates a nearly soundless percussion that attracts soldier termites. 4. Moss Farm – area filled with nourishing moist moss. 8. 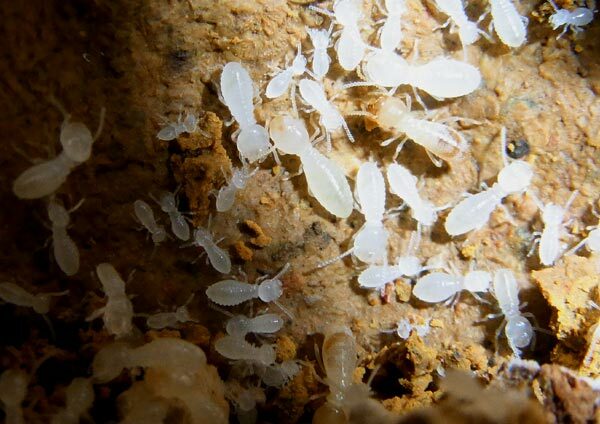 Mutated Termites – their bodies and behavior changed by their proximity to the radiation from the deeps. 9. Deeps Ants Raiding Party – ants from far underground come to raid the termite nest for eggs and larvae, they have jaws and toxins specifically designed to kill termites. 10. 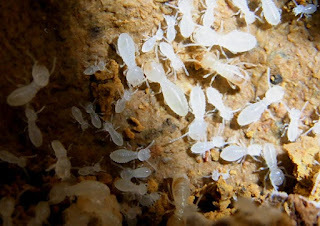 Worker Termites - standard pale-bodied giant worker insects with strong chewing jaws. 11. Soldier Termites (Cutters) – warrior caste of the giant termites, triple the size of a worker and armed with overlarge scything mandibles a third of the size of their bodies. 12. Giant Mole – particularly hungry for giant termites and worms, but will attack anything soft-bodied as it erupts through the side of a passage. 13. Soldier Termites (Acid) – warrior caste of the giant termites, triple the size of a worker and armed with piercing mandibles and an acid-spraying nasus on top of its head. 14. Shard Leech Scree - razor-edged stones used as the shell of a 4"-14" land mollusc, hide in areas of loose rock waiting for man size or larger prey, throw themselves en masse at a target, pierce flesh and release a mild paralytic venom, drink their fill of blood, fall out of the target, and move away from the remains. 15. Mound Toad – huge darkly camouflaged toad, capable of swallowing multiple giant termites, or a man, at once. 16. 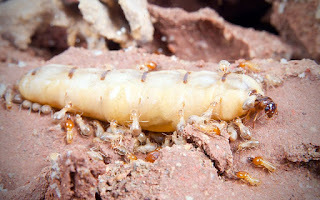 Worker Termites - standard pale-bodied giant worker insects with strong chewing jaws. 1. 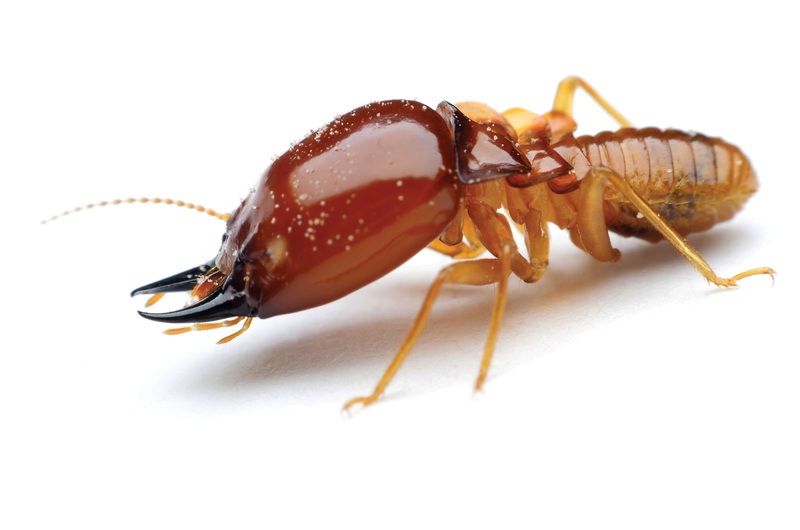 Termite Trappers – equipped with pheromone traps and giant lizard mounts. 2. Delver Group – party of NPCs from the Delvers' Collective, going to or coming from a mission in the depths. 3. Pulp Farmers – here to collect twice-digested wood pulp from inoffensive nymphs to be sold to make paper. 4. Firebombers – alchemists, elementalists, and their guards, here to burn back a section of the mound. 18. Termite Drones – winged males, 50% chance they are heading to the queen's room, 50% chance they are heading outside to begin a new colony. Oppps, was trying to edit this comment and managed to delete the comment instead!